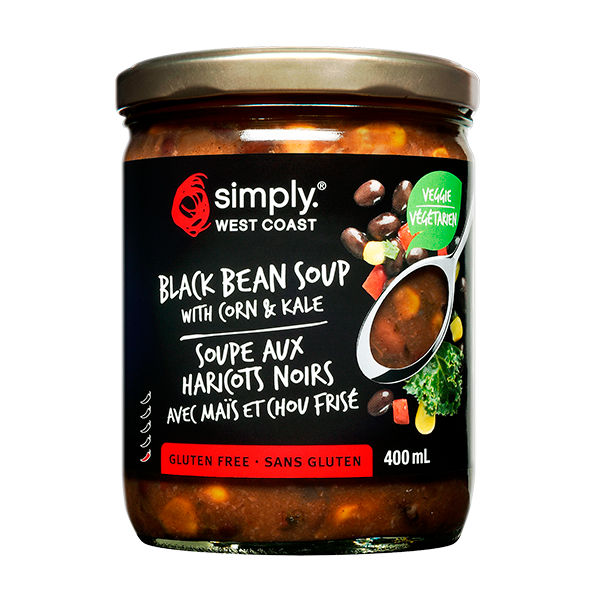 Hearty black bean soup with sweet corn and nutrient rich kale make this a new favourite. Seasoned with sea salt, a hint of garlic and Tabasco sauce for a bit of spice. Water, Black Beans, Fresh Tomatoes, Fresh Onions, Fresh Celery, Tomato Paste, Fresh Carrots, Corn, Tapioca Starch, Olive Oil, Fresh Kale, Apple Cider Vinegar, Sea Salt, Fresh Garlic, Spices, Sugar, Yeast Extract, Tabasco Sauce (Distilled White Vinegar, Chili Peppers, Salt).